South Dakota-named for the early inhabitants, the great Dakotah (later Dakota) Sioux Indians-has more than 83,000 miles of roadway and 5,900 bridges. In 1982, it became one of the first states to complete its Interstate System. This vast network of roads connects the east and west areas of the country to transport farm products. It also serves the expanding tourism industry, providing easy access to the western Black Hills and Mount Rushmore National Memorial and to the area we know as the mysterious Badlands, which means "land bad" or "mako sica" in Lakota. Lewis and Clark first visited the area that is now South Dakota in 1804 and again in 1806, via the Missouri River. Later, when pioneers settled on this prairie land, lack of water, blizzards and isolation were the biggest challenges, and the need for roads was imminent. By 1935, South Dakota had 2,000 miles of hard surface roads and 4,000 miles of gravel highways. The Governor appointed ten men, the Courtesy Patrol, to enforce traffic laws and provide roadside assistance. The Patrol was involved in many life-saving efforts but not in highway fatalities. They rescued residents and motorists during a record blizzard in 1949 and blizzards and floods in 1952. 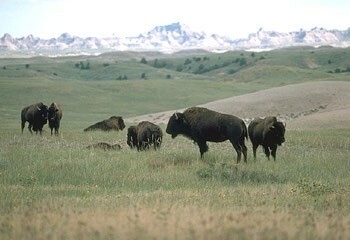 Buffalo graze at the Badlands National Park, South Dakota. Photograph from the the U.S. National Park Service. Driver's licenses became mandatory in 1953. That year 179 people died on South Dakota roads. In 1956, a 40-million dollar highway construction project began and fatalities were on the rise. The Courtesy Patrol was now called the South Dakota Motor Patrolmen and increased to 40 men, and later to 52. In 1958, the Oahe Dam closure was completed and a record 240 people died on the roads. By Executive Order, unmarked patrol vehicles were used to help reduce the traffic accident death toll. Current-day South Dakota has two multi-state Interstate highways passing through it. I-90 runs east-west across the southern part of the state. I-29 runs north-south across the eastern part of the state. Many of the state highways use the numbering that was designated during the 1920s east-west roads have even numbers and north-south roads have odd numbers. Several U.S. highways pass through South Dakota. The east-west routes are U.S. 12, U.S. 212, U.S. 14, U.S. 16, and U.S. 18 (in order from north to south). The north-south routes are U.S. 385 (formerly U.S. 85E), U.S. 85, U.S. 83, U.S. 183, U.S. 281, U.S. 81, and the former U.S. 77 (in order from west to east). The Bureau of Indian Affairs has highway systems in the Indian Reservations of western South Dakota. Official state highway maps indicate the numbers for these roads. 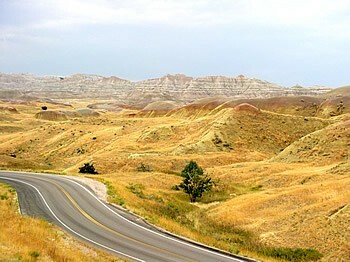 Part of FHWA's Scenic Byways Program, the Badlands Loop Scenic Byway comprises 31.5 miles of roadway and along it are fourteen designated overlooks allowing visitors to stop and appreciate the view. Photograph from the the U.S. National Park Service. With the Black Hills covering 5,000 square miles of mountains, the Badlands National Park consists of 224,000 acres of sharply eroded buttes, pinnacles and spires, and the Badland Wilderness Area covering 64,000 acres. Modern roads are very welcome in the land once included in what was called the New Northwest.